Wondershare PDFelement – A Top PDF editor and converter, trusted by over 350000 business professionals worldwide! With a smart and clean interface that is easy to navigate. It supports many popular file types and has all the file management features that are required for corporate use. Let you create, edit, combine, transform, protect, annotate, watermark, combine and organize PDF files with ease. OCR supports over 20 languages. – Change PDF texts, images and modify pages of your PDF easily. – Transform or convert PDF to/from Excel, PPT, Text or even Word documents at incredible speed. – Enable OCR to turn scanned PDFs into editable, selectable and searchable texts. – Turns image based PDFs into selectable, searchable and editable documents. – Highlights fillable fields when filling out forms. This is one of the best PDF editors that is packed with professional tools that let you edit, combine transform and organize PDFs with so much ease. With the Wondershare PDFelement you have a tool that can solve all your annotation, password protection and digital signature problems. And that is not even all. This fabulous all in one PDF solution can also extract, merge and split and print documents to PDF. The software comes with an industry leading OCR tool which can help you turn image based PDFs to selectable and editable documents while maintaining document layout. Features: What can PDFelement do for you? 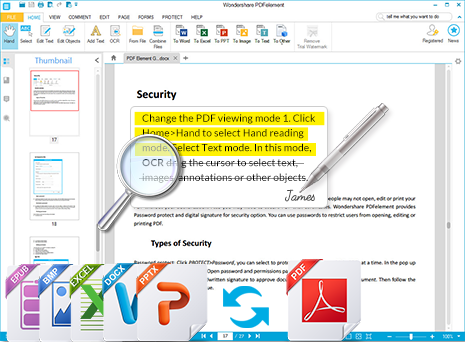 Wondershare PDFelement allows you to edit an existing or new PDF document easily. All you need do is just a simple click on the “Edit PDF” button and choose the file you want to edit and start the process. You can delete, add or edit text, change font size, color, insert and crop images etc. This tool will help you convert PDF files to other formats and vice versa. For example, you can convert PDF to Excel , PDF to Word, PDF to PowerPoint, PDF to Text, Html, EPUB, etc. Also, you can convert to images like JPEG, JPG, TIFF, PNG etc. It also allows you to create Adobe compatible PDFs. The software comes with industry leading optical character recognition technology which can be used to transform any scanned document into fully searchable, selectable and editable documents. With PDFelement OCR technology, you can comfortably transform an image based PDF document into a usable text while keeping the document appearance. OCR supports over 20 languages including English, Simplified Chinese, Romanian, Japanese, Bulgarian, Russian, Portuguese, Catalan, Korean German, Croatian, Polish, Spanish, Czech, Turkish, French, Greek, Ukrainian, Thai, Italian, Dutch, Traditional Chinese, Slovak. This tool will allow you to add an open password that will prevent unauthorized users from accessing your PDF files . It also goes a step further restrict user’s access to editing, extracting, copying and PDF printing when you choose to set permissions for your documents. There is an availability of industry standard encrypted digital signature and you also have the option of creating one to be used for handwritten signature. Combine multiple file formats like Word, Excel and PDF, or separate large PDFs. Add notes and create custom stamps. Strikeout, underline and highlight text. Extract specific pages from a document to create new PDF files as per your needs. Print documents to PDF document and make it easier to store, search and share. Keep PDFs organized and professional with custom headers and footers. Insert new pages into PDF or replace existing pages with other PDFs. Create custom watermarks to protect pages. Quickly and conveniently organize PDF pages with easy indexing method. Simplify file sharing by reducing size without losing quality. Flag specific sections in PDF document for easy reference. Embed links to webpages or other parts of your PDFs for quick navigation. Customize the positioning of PDF pages to a certain degree. Advanced encryption and advanced fraud SECURE protection. Ready to Try or Buy PDFelement for Windows or Mac?